Silicone Rubber Reusable Earplugs with Valve. 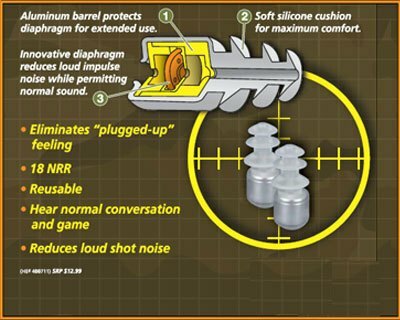 Moving internal diaphragm attenuates harmful high-level, loud impact noises, yet allows passage of normal background sounds and warning signals. 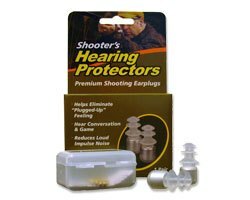 We use these plugs at the range and in the field and have for years. They are comfortable to wear for unobtrusive use. Internal valves are removable for washing of the covers. 1 pair complete with carrying case. Now increased protection of NRR 18dB.